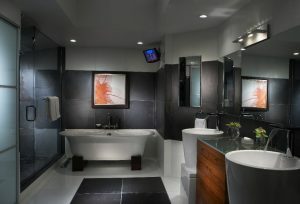 An interior design agency in Miami provides expertise in the bedroom and the bathroom — J Design Group. We excel in creating beautiful spaces where our clients can live with confidence while friends visit; likewise, with visiting family from distant states. Our knowledgeable team works with the client to best understand the vision the client has for the space. We then focus on all of the key elements of the home, determining the values and the vibe of the area. Next, we “create a functional environment in each of these elements that optimizes space and finally, create a unique design solution that relates to client’s vision while maintaining a balance between functionality and aesthetics,” per our website. We employ our expertise in a variety of spaces, whether it be commercial or residential, but this article will focus on how we work together with the client to maximize the appearance of the bedroom and bathroom in residence. The bedroom is a sanctuary that our clients deserve for leisurely enjoyment and pleasant rest. 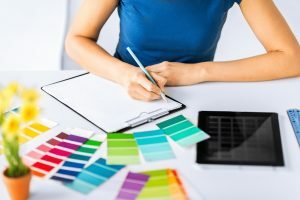 Based on the taste and requirements of the customer, our team of professionals can provide a wealth of models and color themes to the client’s preferences. The bedroom is one of the most important places in the residence. However, the wash area often has the least concentration of effort since visitors rarely see the bedroom. This does not make sense, and we implore you to reconsider this false ideology of thought. Imagine, it’s Friday, and it has been a long week. There were various problems during the week that were resolved. Friday evening means a date with the wife. This is pleasant, filled with cheer and elegant conversation. Following the dinner, the pair returns home and soon walk to their bedroom. As you enter the bedroom, your mind is put at ease with the immaculate presentation provided by the best interior design agency in Miami. The home should be designed with the intentions that every family member will enjoy it. 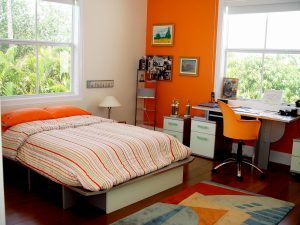 This is one of the reasons that the bedroom is the most important space in residence. distinction from consistently providing exceptional service and value since our inception. A goal that we have for ourselves is to design each residence to fulfill their dreams; ultimately transforming the space into a place of love and enjoyment for each member of the family. It is important that the bedroom is safe, reflective space. According to the Centers for Disease Control and Prevention (CDC), one in three adults does not get enough sleep a night. “Sleeping less than seven hours per day is associated with an increased risk of developing chronic conditions such as obesity, diabetes, high blood pressure, heart disease, stroke, and frequent mental distress,” the CDC provides. Our skilled Miami interior designers are ecstatic to commence the transformation of the bathroom into a cozy, yet highly functional space in the residence. Each of our previous designed spaces was both creative and unique. We have an impressive portfolio of achievements, which includes a “vast variety of exclusive bathroom design projects,” such as hotels, restaurants, and homes that our team has successfully been completed for a range of areas in South Florida. transformed the client’s unique vision into a great built reality. Our top priority is our client’s favorable perception; therefore, we encourage participation from the client during every stage — ranging from planning to implementation. The bathroom will have wall coverings, floorings, and fixtures that each complement one another in the space. Our Miami interior design agency is confident in providing an immaculate space. It is important that the bathroom inspires confidence with each of the parts that make it a whole. Cabinets are selected with the best material and color. One of our specialties is designing glass paneling plus mirrors that juxtapose natural brightness with state-of-the-art illumination for an overall impressive vibe. We employ careful attention to detail, and the space upon completion recognizes that. The space must be mesmerizing and inspiring. For instance, each morning during the weekday, the first room that the couple enters upon waking is the bathroom. For the couple, this means waking up early to prepare for work. Our expertise as a Miami interior design firm ensures the space is well balanced and is pleasing to the eye upon first awakening. This article highlighted how our Miami interior design company could transform a space into an immaculate reality. We can accomplish this ambitious feat due to our tremendous experience and abilities. While this article highlighted our services, it is also important to consider reviews from our previous clients. “Ms. Corredor’s ability to convey and interpret the interior design budge far exceeded my highest expectations leaving me with the utmost satisfaction of our project,” Sam S. wrote.